Issues were not handled. Features are poor. The contract is designed to lock you in instead of supporting the clients’ needs. The mobile app doesn’t have the reliability and features needed and it doesn’t seem like they’re investing in it. Their basic service is fine but when you have a real problem they only help as a last resort. Cons: Contracts, tech support, client relationship. We originally looked for a company in town but UniVoip was so great we decided to go with them. Their customer service is the BEST! They had a competitive price and they walked us through everything so the transitions was easy. Best decision we’ve made this year! Pros: Great customer service, good price. UniVoIP is a cloud communications provider that offers users high speed Internet connectivity and phone service in one inclusive solution. In doing so, the provider utilizes cutting-edge VoIP technologies to deliver Virtual Hosted Business Telephone solutions with full functionality. 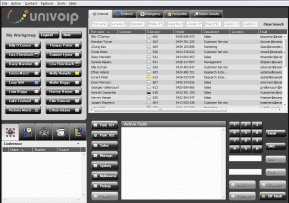 In addition to Internet connectivity, UniVoIP’s service is also able to offer users enhanced voice services such as auto attendant, single or multi-site extension dialing, directory services, unified messaging, and centralized management. 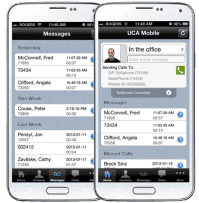 UniVoIP’s Business Phone Solution, Office Connect, connects users to each other and clients regardless of location—i.e. main office, home office, satellite office, mobile workers, and even International offices. UniVoIP’s service comes equipped with the standard set of features including Call Group, Call Park/Retrieve, Callers List, Click to Call, Company Directory, Direct Inward/Outward Dialing, Monitor Call, Monitor Call Silent, Monitor Phone, and much more. Additionally, the provider allows users to keep their current phone and fax numbers. UniVoIP also offer a digital fax service, UniFax VoIP Fax, which delivers faxes over IP solution for efficient, paperless, and secure transmission via the Internet. Aside from service, UniVoIP also offer phones and hardware for users’ systems. Pricing for UniFax is $2.75/per month if purchased with calling plan. Calling plans vary in price. For example, a managed system with 5-19 users, 50+ features, US based support and lifetime warranty on all hardware, Personal Voicemail, Local Phone Number/DID, E911, pricing is $29.95 per month, per user. Custom/individual pricing is also available. In terms of support, UniVoIP offers phone and email support, as well as resources such as FAQs, IP Phone Maulas, Voicemail Guides, Administrator Guides, Teleworker Setup Guides, Softphone Guide, Conferencing Guide, Downloads, and Video Training for 12 and 24 button systems. Fiber On-Net Internet access, dedicated and non-oversubscribed symmetrical access up to 1,000 Mbps. What Do You Think of UniVoIP?